Josiah Bissell, brother of Charles P. Bissell, is credited with changing the name of the street from East Main Street to East Avenue. He had approached the Common Council to officially change the name. Being unsuccessful, he and a friend took matters into their own hands, by hanging hand-painted "East Avenue" signs at every comer. Thus, the name was changed from East Main Street. 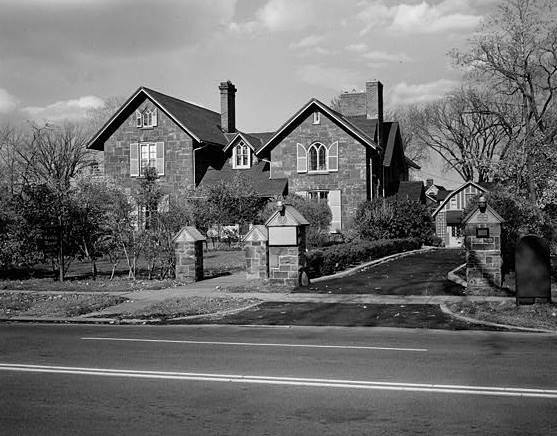 Julia Bissell was a woman of presumed independent means as she purchased other extensive property at the time of the purchase of 666 East Avenue. The third owner, Schnyler Colfax, was the son of the Vice-President. He was associated with the Artura Photo Paper Company, Columbia, Ohio. When Eastman Kodak purchased the company, Colfax came to Rochester as sales manager. C. P. Bissell's brother, Josiah, an engineer, architect, planner and speculator is supposed to have built the house from stone taken from the Holy Sepulchre Cemetery and the first Erie Canal Aqueduct. When the Colfax family took possession in 1910, the house was enlarged, the back roof raised, and the whole rear was greatly changed. The original plans called for eight rooms. A sleeping porch was added to the rear west bedroom. Some servants rooms were added. The design of the west porch was changed to its present form. A porte-cochere was constructed to the east. This was demolished by a truck and has been replaced by a plainer entrance. In 1926, further alterations were made. The double parlor on the west side of the first floor was opened into one room. The original fireplaces were removed and replaced by a new single fireplace. The pipe organ in the foyer was removed. A second floor bathroom was installed. Since the purchase by the Rochester Methodist Home in 1952, the service areas have been enlarged. The butler's pantry is as it was in 1926. The additional kitchen space was obtained by eliminating the servants dining room, pantry and a passage way to to the rear porch. All were originally off the north of the room. In 1955-56, a modern institutional addition designed by C. Storrs Barrows was made to the northwest.